Night-tabs.com is a pharmacy I did some research into recently. It didn’t take much time in the archives to figure out that this online pharmacy was identical to and online simultaneously with a defunct clone website I have reviewed called night-meds.com. Like the latter website, the Night-tabs.com domain is in the custody of the US ICE-Homeland Security Investigations. The similarities are unmistakable starting with the website design. The drugs that were stocked by this pharmacy were produced in India and this store also claimed that they were all approved by the Indian FDA. The identical FAQ section similarly told intending customers, whose home or residential countries’ laws so demanded, to provide prescriptions for purchases. Cancer, Cardiovascular Disease, Men’s Health, Antidepressant, Mental Disorders, Hypertension, Erectile Dysfunction, HIV, Neurological Disorders, Diabetes, Women’s Health, Anti-Inflammatories, Eye Care, and Muscle Relaxant constituted a large portion of the drug categories available. In the “Erectile Dysfunction” section, I noticed the exact same drugs alongside Levitra, Viagra, and Cialis. 120 pills of Viagra (100mg) were sold for $169.95, 90 pills of 20mg Cialis sold for $189.95, and 60 pills of Levitra (20mg) cost $164.95. Only Credit Card payments were accepted. The same shipping costs applied to Standard International Airmail and Express International Mail. $9.95 and $29.95 respectively. Standard International Airmail delivered medications in 10-21 days and Express International Mail took 5-9 days. Unsurprisingly, I found the same reviews I found on the clone website in the “Testimonials” tab for Night-tabs.com. But in this case, I was able to find an isolated review on onlinepharmacyreviews.org. It was written in 2015 by a buyer named Bluedevil07 who captioned his review: “I have NOT received my products”. He related his experience with shopping on Night-tabs.com by discussing an order he had placed on January 28, 2015. A month and a half after that, he became nervous about the delay and decided to email the pharmacy. He got a response that the post office had tried to deliver the order but there was no one to sign off on it. He was confused because the shipping information he had obtained from the website specifically stated that Night-tabs.com uses unregistered mail which does not require a signature. 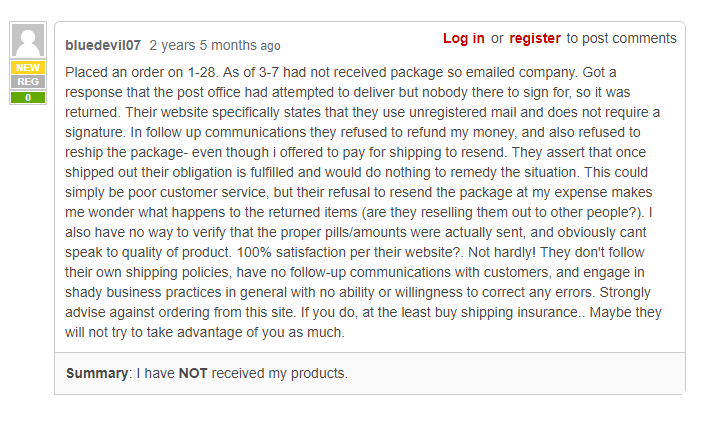 This user revealed that in follow-up communications, the store refused to refund his money and also refused to reship his package even though he offered to pay the shipping fee again. He was told by customer service that the pharmacy’s obligations were fulfilled with the first shipping. That raised two question in this user’s mind. Were the undelivered products returned and sold to someone else? Were they actually delivered in the first place?. This user came to the conclusion that the store doesn’t follow their own shipping policies, has no follow-up conversations with its customers, and engages in shady business practices in general with no ability or willingness to correct any errors. He strongly advised against ordering from the website but recommended shipping insurance for any who would like to take the risk. So, I had both internal and isolated reviews for Night-tabs.com. This isolated review, in particular, captured the essence of the message displayed on the website which is now located on a US server. The domain has been seized by the United States Immigration and Customs Enforcement and Homeland Security Investigations for knowingly trafficking in counterfeit goods. Scamadviser.com and Legitscript had their own interesting assessments of this fraudulent pharmacy. Scamadviser.com gave Night-tabs.com a 33% rating and confirmed that the domain is now in the possession of the US government. The analysis also revealed that the domain was registered 3 years ago. Malaysia was listed as a likely origin country which led Scamadviser to note that country’s record as a High Risk country. The real location, however, is being hidden. The creation date was confirmed by Legitscript.com as well as Malaysia being the registrant country. This resource concluded that Night-tabs.com was a Rogue Internet Pharmacy. One of the identifying marks of Rogue Internet pharmacies is engaging in unscrupulous business practices. The discounts you see in the screen grab are the same ones that were available on Night-meds.com. 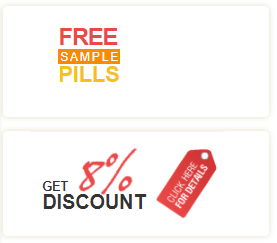 Like its clone website, Night-tabs.com offered free sample pills and an 8% discount. Adding extra pills to orders is a bonus that is in widespread use when it comes to online pharmacy marketing and customer satisfaction strategies. On stores where Erectile Dysfunction drugs are the most popular, they are also the pills used in this bonus. The eight percent discount was apparently applied to the purchases of returning customers. This kind of discount is pretty standard. Other stores may start with a discount on a customer’s initial order and then apply a second one for every next purchase. Discount coupons may also be used to apply discounts as well. Shipping of orders free of charge for customers who purchase drugs worth more than $200 or some other sum is also in widespread use. It was at the very beginning of my research into Night-tabs.com that I noticed the striking resemblance it had to what, it has now been revealed, was a clone website called Night-meds.com that ran simultaneously with it. I had already acquainted myself with the clone website in a previous review. So once it became clear that this was a copy, I was hardly surprised by all the similarities between the two of them. Foremost among those similarities was the fact that they have both been seized by the United States ICE-Homeland Security Investigations led war on Copyright violations in the online pharmacy marketplace. Night-tabs.com faced the same charge of knowingly trafficking in counterfeit goods. 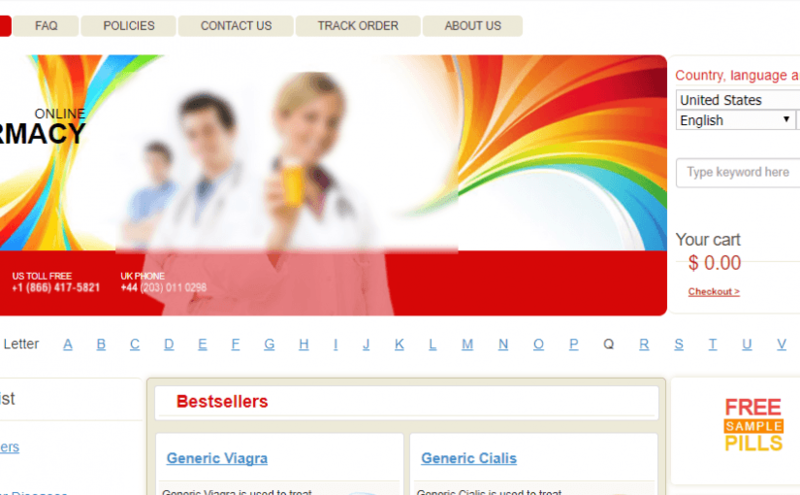 The generics available on this store were India FDA-approved and depending on the existing laws in a given territory or country, the website asked customers who resided in such locations to provide a valid prescription before payment. The drug categories included Cancer, Cardiovascular Disease, Mental Disorders, Antidepressants, Hypertension, Erectile Dysfunction, Neurological Disorders, Men’s Health, HIV, Diabetes, and Women’s Health among others. The on-site reviews were exact replicas of those on Night-meds.com and were positive. Unlike that website, however, I managed to find an unassociated review for Night-tabs.com. It sounded like exactly the kind of experience one could have on a scam pharmacy. Scamadviser confirmed the domain’s confiscation and revealed that it was registered three years ago. Malaysia, a High Risk country is a likely origin. Night-tabs.com was given a 33% rating. I am giving it 1 out of 5 stars.